If winning football games is your biggest priority then make it 6 things. A winning record of 46-7 is no small accomplishment; however, looking long-term there are 5 other things that, when the disappointment clears, I think will be recognized and appreciated. Putting aside for the moment the NCAA investigation (which is likely more smoke then fire) Chip built his program the right way. Every player he signed to a scholarship as a head coach made it into the university. I’m sure that very few programs can match that. Chip brought in kids that wanted be Oregon Ducks and had the character traits that would make them good members of community. If you had poor character traits then you did not get an offer. It was as simple as that. The time spent by players doing positive works in the community are not as well known as the victories on the field but they are significant and have made a difference. Giving back was not just taught, but practiced. In this area Chip Kelly made significant improvements in the Oregon football program. Chip Kelly left things better than when he arrived. How many programs with a coach leaving can say that? Oregon can say that three times now, for the same was true of both Rich Brooks and Mike Bellotti. He built the skills of his staff and created a team atmosphere. Can there be any doubt that the knowledge and skills of the football staff are not greater than when he arrived? He was loyal to his coaches, only one of whom he hired. I once heard one of these coaches, who was well-traveled, say that Oregon was unique in that the coaches were team players as opposed to coaches who only wanted to advance themselves. Once Chip was promoted, there was no attempt to put his own mark on things by bringing in several new coaches. You might think, “What? He just walked out on his coaches.” Well, hang on a moment and I’ll address that. He did right by our military. Touched inside after attending the funeral of a local soldier in early 2010, Kelly contacted the military and inquired about visiting troops overseas. Months later he traveled with other coaches and the trip changed his perspective. When later asked about it he had this to say, “I don’t think people realize exactly how hard these people work – six, seven-day weeks, 18-hour days, sleeping five hours, then going back to work. 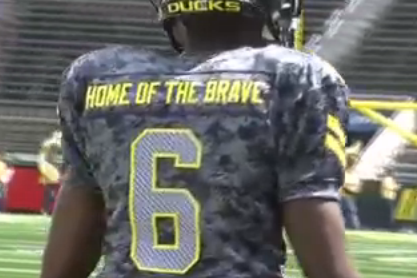 Obviously, what they do is real; what we do is a game…” From that point on spring games became about supporting the troops, including special military style uniforms that said “Home of the Brave” and which were given to members of the military afterward. Am I disappointed that Chip left for the Philadelphia Eagles and the NFL? Sure. If you are an Oregon Duck fan how could you not be? The world of sports today makes it virtually impossible to have a smooth coaching transition. Coaching opportunities can open and close with incredible swiftness. There is never a good time for a change. However, I believe that last year’s interview with Tampa Bay Chip put in motion a process that would protect the program and coaches. A plan of succession evolved that will allow Oregon football the opportunity, if they chose, to promote from within to build on what Chip Kelly built and what Rich Brooks and Mike Bellotti built before that. Everyone knows that Chip Kelly had one philosophy that trumped all others — Win The Day. WTD is not about doing the impossible, it is about achieving your very best for that day, and doing that every day. It seems a little selfish on the part of Duck fans to expect less for Chip. In the same way that winning at Oregon is recognized as a greater achievement than winning at New Hampshire, so it is with the NFL. Coaching with and against the best football players in the world is the logical next step for a coach that expects to achieve his full potential. And to those fans that say it will be harder to win at the NFL — you just proved the point. It is a bigger challenge and the next logical step for this coach if he is going to practice what he preaches. So what are we left with? To me it is a bit like telling your seven-year old that Disneyland closed today but don’t worry, things will be alright. Well, yes and no. You don’t just replace Disneyland and you don’t just replace Chip Kelly. And trust me, if you have been a Duck fan the last 4 years you have been on one long visit to Disneyland. I can still remember walking out of Disneyland as a kid and feeling sad. But that soon dissipated and to this day I have fond memories of that first visit with my parents and younger brother. It wasn’t my last visit to Disneyland and I believe this won’t be the last time Oregon enjoys success on the football field. 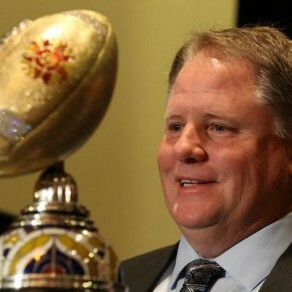 So for me, I wish Chip Kelly the best as he strives to WTD at the next level. And I also look forward to the time down the road we as Duck fans can look back with fond memories of a special time for Oregon football. But for now it just feels sad. Nothing lasts forever. The day others and I always knew would come has arrived and we are only left with the cruel reality of — Next Man In.